This pattern is part of Whimsical Little Knits, a collection by Ysolda Teague. The patterns are becoming available one by one as downloads, but the entire collection will then be made into a book and I'll receive a copy of that as well. I spent two days knitting this on size 10 needles last weekend, then ripped it out and spent the next day knitting it again on size 11s. Good thing it was a long weekend. 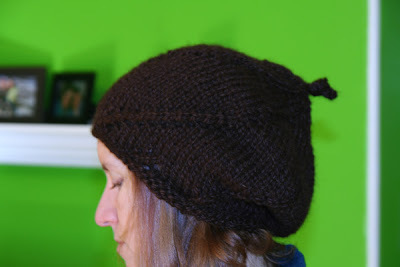 It's a fun pattern and the hat is cute, but I was pretty disappointed to see how it looked on me. I'm becoming convinced that I shouldn't wear bulky yarn on my head. 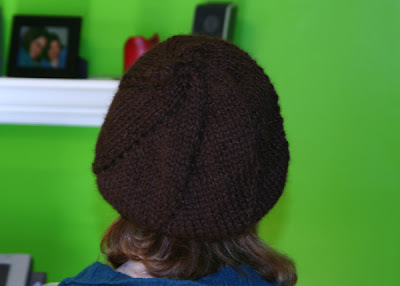 My inclination is to frog it and use the yarn for mittens instead, but every time I put it on, Eric smiles at me and says "You look so cute in that hat!" So, I don't know. Maybe I'll keep it around for a while. What do you think? That hat does look very cute on you! Any hat called "chocolate icing swirl hat" that is not actually edible is damned dishonest. Rename the hat or get rid of ti. Kevin doesn't know much about knitting, does he?